French Polynesian holiday destination Tahiti Pearl Beach Resort is now home to several Tempest commercial umbrellas from Auckland based shade company Shade7. 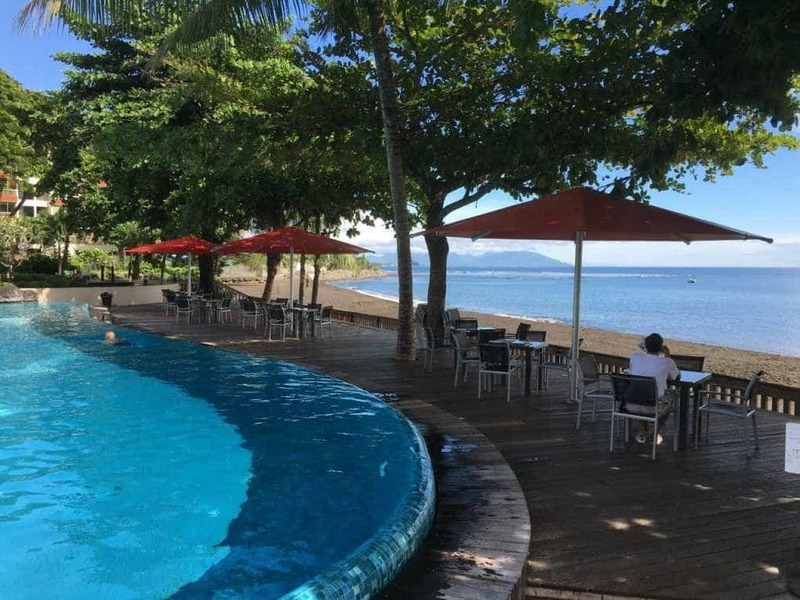 Tahiti Pearl Beach Resort is located in Matavai Bay, set upon the tropical Lafayette Beach which is only ten minutes from downtown Papeete. Lafayette Beach has beautiful fine black volcanic sand which is used in spas around the world for its mineral and exfoliating properties. Matavai Bay is home to wild dolphins throughout the year and humpback whales between July and November, which is a great attraction for visiting guests. Among other amenities the resort is home to a large infinity pool situated right beside the beach, with a deck between the two areas. It became necessary for the resort to seek out a solution to offer shade for customers relaxing in this space. New Zealand company Shade7 supplied their largest commercial umbrella, the 5 metre square Tempest, which was an ideal solution to this tropical beachside location. Each Tempest umbrella offers 25m² of shade but in addition the canopy offers guests rain cover and protection from falling leaves and unwanted bird droppings from the overhead trees. The Tempest has been supplied in red, which is an iconic colour of French Polynesia and brings a splash of colour to the resort. The Tempest has cleverly been engineered to withstand strong wind gusts of 80km to 100km per hour while open. Due to the coastal nature of the resort, the beachfront area of Tahiti Pearl Beach Resort can be exposed to high winds, so Shade7 supplied the umbrellas with PVC canopies which are exceptionally durable and waterproof. The PVC is made with 720gsm/1000 denier and a 0.6mm thickness which gives it superior strength. The new umbrellas are a wonderful new addition to the resort and are being well enjoyed by their guests already. Tahiti Pearl Beach Resort are now prepared for the busiest season of the year, with June to August traditionally having the coolest and driest months. To discuss your commercial umbrella requirements, contact Shade7 today.